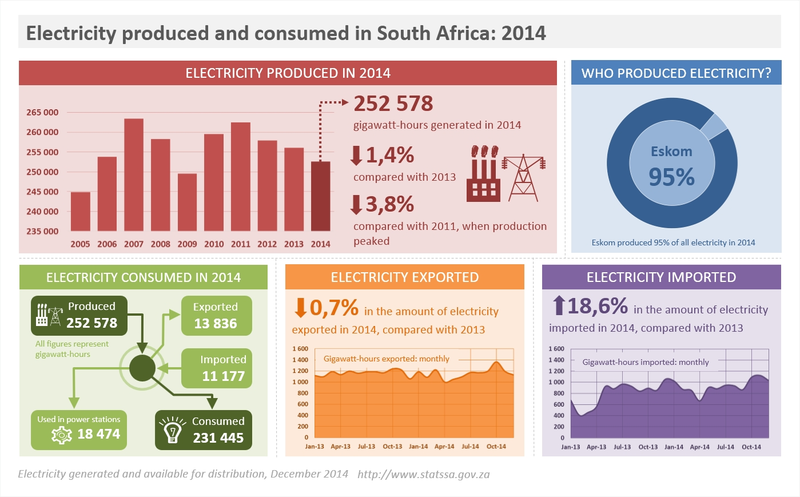 Less electricity was generated in South Africa in 2014 compared with 2013. Recent data show that national electricity production has been in decline after peaking in 2011, highlighting the country’s continued struggle to keep the lights on. The latest Electricity produced and available for distribution publication, released by Stats SA on Thursday, 5 February 2014, shows a 1,4% decline in the amount of electricity produced in 2014 compared with 2013, decreasing from 256 073 GWh (gigawatt-hours) in 2013 to 252 578 GWh in 2014. Annual production peaked in 2011, with 262 538 GWh generated during the course of that year. A portion of the total electricity produced is used in power stations and exported to neighbouring countries. The remaining bulk of the electricity, however, together with some imported capacity, is consumed by residential, government, business and industrial customers. The data show that South Africans are consuming less electricity, with just 231 445 GWh of electricity consumed in 2014, decreasing by 0,7% from 233 105 GWh in 2013. The decline in the volume of electricity produced has been offset, albeit slightly, by purchases of electricity from neighbouring countries. The annual volume of electricity imported into South Africa increased by 18,6%, from 9 428 GWh in 2013 to 11 177 GWh in 2014. Exports of electricity, however, remained stable: in 2013, the country exported 13 929 GWh of electricity, decreasing by only 0,7% to 13 836 GWh in 2014. Note: exports and imports refer to cross-border flows of electricity.